Current inguinal hernia operations are generally based on anatomical considerations. Failures of such operations are due to lack of consideration of physiological aspects. Many patients with inguinal hernia are cured as a result of current techniques of operation, though factors that are said to prevent hernia formation are not restored. Therefore, the surgical physiology of inguinal canal needs to be reconsidered. A retrospective study is describer of 200 patients operated on for inguinal hernia under local anaesthesia by the author's technique of inguinal hernia repair. The posterior wall of the inguinal canal was weak and without dynamic movement in all patients. Strong aponeurotic extensions were absent in the posterior wall. The muscle arch movement was lost or diminished in all patients. The movement of the muscle arch improved after it was sutured to the upper border of a strip of the external oblique aponeurosis (EOA). 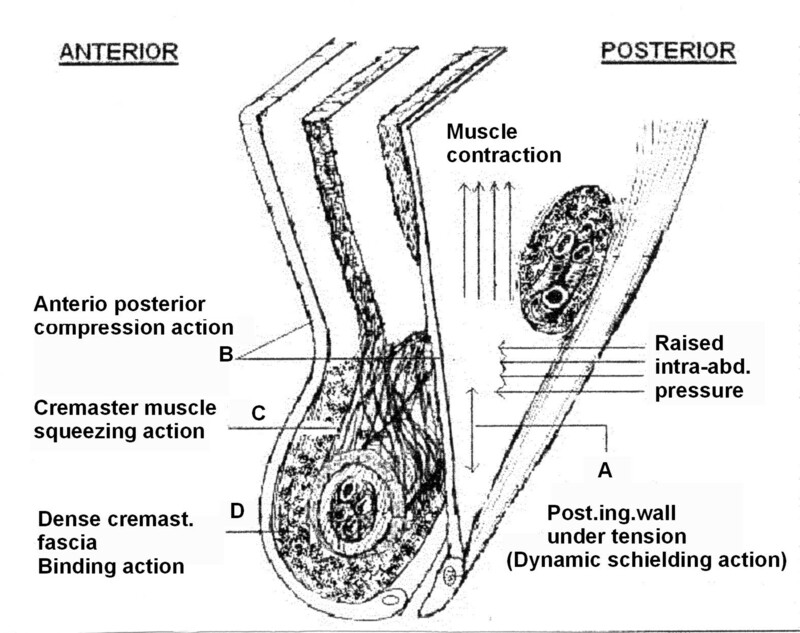 The newly formed posterior wall was kept physiologically dynamic by the additional muscle strength provided by external oblique muscle to the weakened muscles of the muscle arch. A physiologically dynamic and strong posterior inguinal wall, and the shielding and compression action of the muscles and aponeuroses around the inguinal canal are important factors that prevent hernia formation or hernia recurrence after repair. In addition, the squeezing and plugging action of the cremasteric muscle and binding effect of the strong cremasteric fascia, also play an important role in the prevention of hernia. Inguinal hernia repair still remains a problem because of the 1) high recurrence rates seen in the hands of the junior surgeons, 2) risky dissection of the inguinal floor in the Bassini/Shouldice repair and 3) infection and chronic groin pain following mesh repair. The successful management of any problem depends on the understanding of its patho-physiology. In this context, some questions related to the physiology of the inguinal canal or factors that prevent herniation still exist. Lateral and cephalad displacement of the internal ring beneath the transversus abdominis muscle and approximation of the crura results in a shutter mechanism at the internal ring. When the arcuate fibers of the internal oblique and transversus abdominis muscle contract, they straighten out and move closer to the inguinal ligament (shutter mechanism at the inguinal canal). [2, 3] This opposite movement (upward & downward) of the same muscle needs proper explanation. 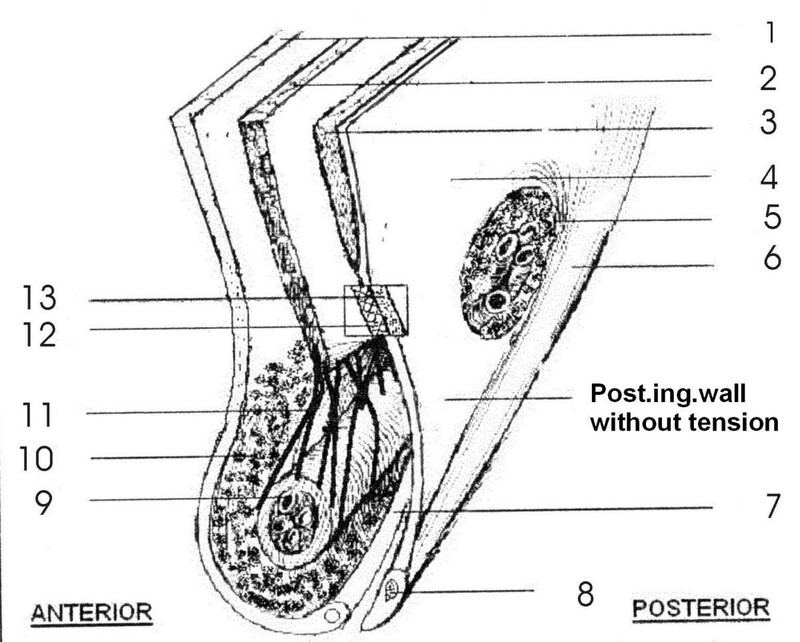 The term "obliquity of the inguinal canal" is not a perfect description since the spermatic cord is lying throughout its course on the transversalis fascia. Repeated acts of crying, thereby increasing the intra-abdominal pressure do not increase the incidence of hernia in new born babies inspite of the almost absent "obliquity of the inguinal canal" or "shutter mechanism". Similarly, every individual with a high arch or a patent processus vaginalis does not develop hernia. Factors that are said to prevent herniation are not restored in the traditional techniques of inguinal hernia repair and yet 70–98% of patients are cured. Then what are the additional factors that play a role in the prevention of hernia after surgery? 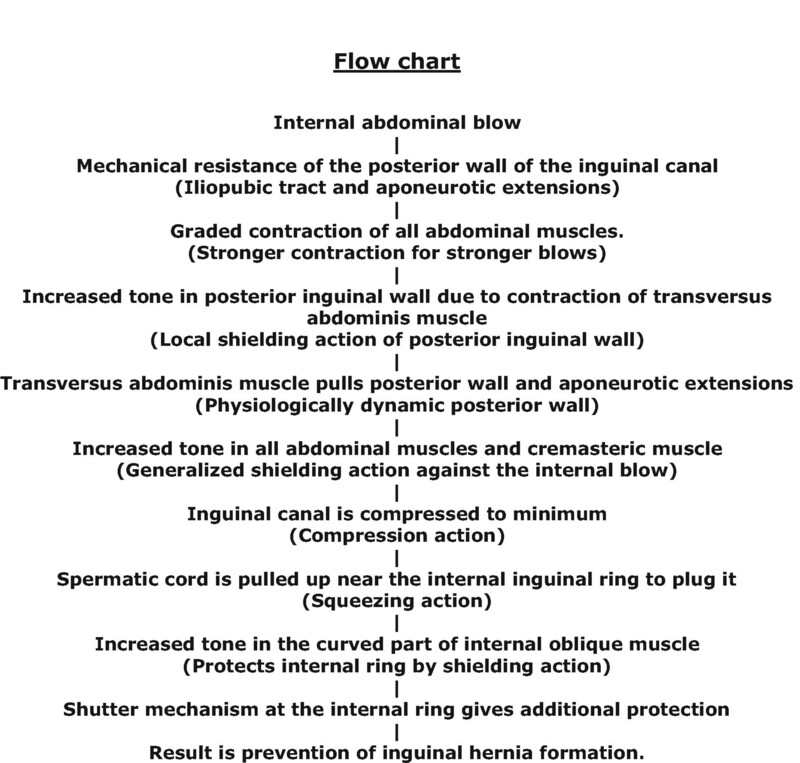 The author conducted this study in 200 patients who were operated by his technique under local anaesthesia, and observed the changes in the physiology of structures in and around the inguinal canal, before and after repair of the inguinal hernia. The author described for the first time, a new method of inguinal hernia repair based on physiological principles. inguinal canals in 212 patients were opened under local anaesthesia between January 1995 to December 2001. From among these, the author conducted a retrospective study of 200 patients between the age group of 20–60 years, with normal or average nourishment. Malnourished and obese patients were excluded. 116 patients had indirect and 84 patients had direct inguinal hernia. 60–80 ml. of 1% xylocaine local anesthetic agent was used without adrenaline. No sedation was used before or during surgery. Repair was done by suturing an undetached strip of the external oblique aponeurosis as described in the author's technique of hernia repair. General observations were made and recorded about anatomical structures forming the canal, and their movements during surgery both before and after repair by asking each patient to cough on the operation table with maximum force. Electric stimulation was used only for the cremasteric muscle, which did not respond to cough in any of the patients. Movements of the posterior wall, external oblique, internal oblique and cremasteric muscle were recorded in three grades as no movement, poor movement, or good movement. Density of the cremasteric or interparietal fascia was judged as loose or firm by the force required severing this fascia by blunt dissection. Skin and fascia are incised through a regular oblique inguinal incision to expose the external oblique aponeurosis. The thin, filmy fascial layer covering it is kept undisturbed as far as possible and an assessment made about the strength of it and its thinned-out portion. The thinned out portion is usually seen at the top of the hernia swelling, extending and fanning out to the lower crux of the superficial ring. The external oblique is cut in line with the upper crux of the superficial ring, which leaves the thinned out portion in the lower leaf so a good strip can be taken from the upper leaf. The external oblique, which is thinned out as a result of aging or long standing large hernias, can also be used for repair if it is able to hold the interrupted sutures. The cremasteric muscle is incised for the herniotomy and the spermatic cord together with the cremasteric muscle is separated from the inguinal floor. The sac is excised in all cases except in small direct hernias where it is inverted. The medial leaf of the external oblique aponeurosis is sutured with the inguinal ligament from the pubic tubercle to the abdominal ring using 1/0 monofilament polyamide (Ethilon) or polypropylene (Prolene) interrupted sutures. The first two sutures are taken in the anterior rectus sheath where it joins the external oblique aponeurosis. The last suture is taken so as to narrow the abdominal ring sufficiently without constricting the spermatic cord (Figure 1). Each suture is passed first through the inguinal ligament, then the transversalis fascia, and then the external oblique. The index finger of the left hand is used to protect the femoral vessels and retract the cord structures laterally while taking lateral sutures. The medial leaf of the external oblique aponeurosis is sutured to the Inguinal ligament. 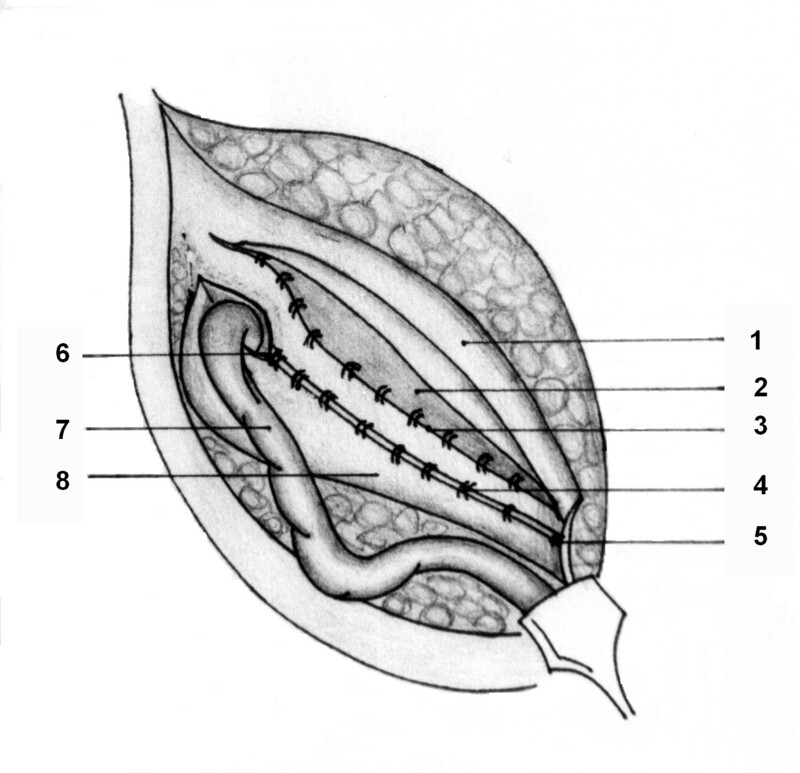 1) Medial leaf; 2) Interrupted sutures taken to suture the medial leaf to the inguinal ligament; 3) Pubic tubercle; 4) Abdominal ring; 5) Spermatic cord; and 6) Lateral leaf. A splitting incision is made in this sutured medial leaf, partially separating a strip with a width equivalent to the gap between the muscle arch and the inguinal ligament but not more than 2 cms. This splitting incision is extended medially up to the pubic symphisis and laterally 1–2 cms beyond the abdominal ring. The medial insertion and lateral continuation of this strip is kept intact. A strip of the external oblique, is now available, the lower border of which is already sutured to the inguinal ligament. The upper free border of the strip is now sutured to the internal oblique or conjoined muscle lying close to it with 1/0 monofilament polyamide or polypropylene interrupted sutures throughout its length (Figure 2). The aponeurotic portion of the internal oblique muscle is used for suturing to this strip wherever and whenever possible to avoid tension, otherwise, it is not a must for the success of the operation. This will result in the strip of the external oblique being placed behind the cord to form a new posterior wall of the inguinal canal. Undetached strip of external oblique aponeurosis forming the posterior wall of inguinal canal. 1) Reflected medial leaf after a strip has been separated; 2) Internal oblique muscle seen through the splitting incision made in the medial leaf; 3) Interrupted sutures between the upper border of the strip and conjoined muscle and internal oblique muscle; 4) Interrupted sutures between the lower border of the strip and the inguinal ligament; 5) Pubic tubercle; 6) Abdominal ring; 7) Spermatic cord; and 8) Lateral leaf. At this stage the patient is asked to cough and the increased tension on the strip exerted by the external oblique to support the weakened internal oblique and transversus abdominis is clearly visible. The increased tension exerted by the external oblique muscle is the essence of this operation. 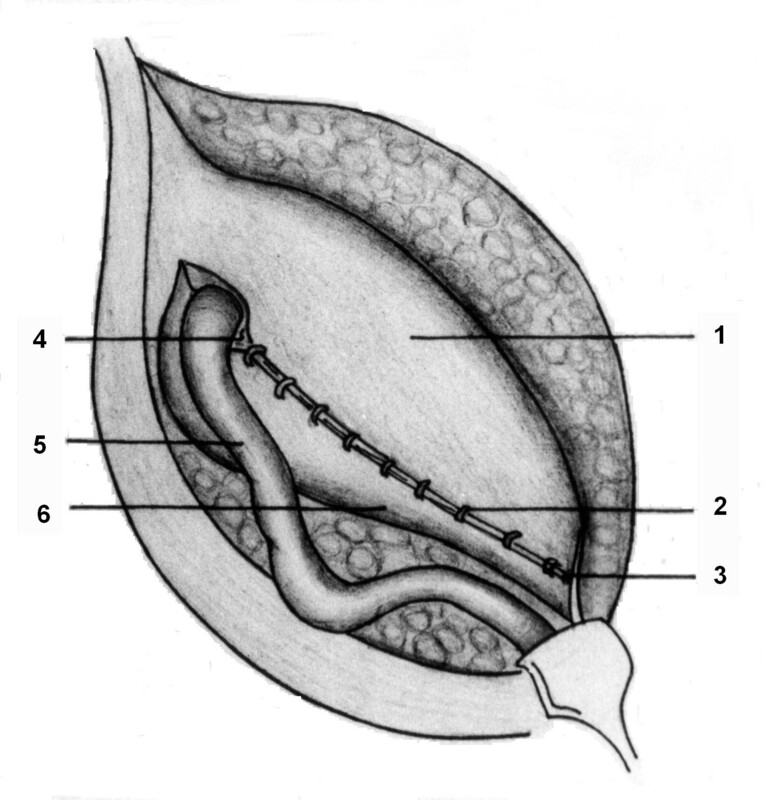 The spermatic cord is placed in the inguinal canal and the lateral leaf of the external oblique is sutured to the newly formed medial leaf of the external oblique in front of the cord, as usual, again using 1/0 monofilament polyamide or polypropylene interrupted sutures. Undermining of the newly formed medial leaf on both of its surfaces facilitate its approximation to the lateral leaf. The first stitch is taken between the lateral corner of the splitting incision and lateral leaf of the external oblique. This is followed by closure of the superficial fascia and the skin as usual. The external oblique aponeurosis was fairly strong and dynamic and the posterior inguinal wall was weak and a-dynamic in all patients. Aponeurotic extensions from the transversus abdominis aponeurotic arch were absent in the posterior wall in all patients. The absent aponeurotic extensions in the posterior wall were replaced with an aponeurotic strip of the EOA to give a strong and physiologically dynamic posterior wall in all patients. In the author's opinion, this is the main factor that prevents recurrence of hernia after surgery. The role of the EOA in anterior-posterior compression of the inguinal canal to prevent herniation is restored by providing a strong and physiologically dynamic posterior wall. The cremasteric muscle did not show any movement on coughing in all patients. However, after electrical stimulation the muscle contracted and a pulling effect on the spermatic cord was observed. The interparietal fascia (cremasteric fascia) was loose in all patients. The binding effect of cremasteric fascia between the muscle arch and the incurved part of the inguinal ligament is lost in all patients. This lost anchorage due to loose cremasteric fascia is provided in the author's technique by suturing the strip of EOA between the muscle arch and the inguinal ligament. Inguinal structures, as living entities that move and function cannot really be appreciated either by dissection on cadavers or operations on patients under general or spinal anaesthesia. Live demonstration of movements of the posterior wall and the musculo-aponeurotic structures around the inguinal canal during the acts of internal abdominal 'blows' (raised intra abdominal pressure) is so far not possible. Imaging of the inguinal canal in patients, with or without hernia, on sonography machines is also not satisfactory because of the small size of the canal and the fact that all structures are seen in black and white. Many operations developed to date deal only with the anatomical aspects of the repair. Any failure in these operations is because the physiological aspects have not been considered while developing a new operating technique. The author has developed a new technique  of pure tissue repair of any type of inguinal hernia without a mesh, based on the concept of constructing a strong and physiologically dynamic posterior wall to the inguinal canal with the help of the external oblique muscle and its aponeurosis. A strip of the external oblique aponeurosis gives replacement to the absent aponeurotic extensions in the posterior wall, making it strong, and the additional strength of the external oblique muscle to the weakened internal oblique and the transversus abdominis muscle keeps it physiologically dynamic. The first recorded observation of dynamic activity in the internal ring of a living nonanaesthetized human being was done in only one patient by Tobin et al. Many such studies of dynamic activity in the internal ring have been done in dogs. Peacock EE  states that little is known about the muscular activity in the internal ring because conventional repair of groin hernia does not adequately expose the normal muscle fibers. Preperitoneal exposure is, of course, performed in an anaesthetized patient; consequently little information has been acquired about the function of a sphincter muscle, even though the internal ring can be visualized clearly. The author has dissected 247 inguinal canals during operations under local anaesthesia and found that in a majority of patients, the muscles around the inguinal canal were weak, with loss of tone and movements, and therefore, failed to provide protection against herniation. The posterior wall of the inguinal canal (transversalis fascia) was also weak, containing only adipose tissue, without any aponeurotic extensions. Naturally, the posterior wall of the inguinal canal was not strong and physiologically dynamic. Changes during raised intra abdominal pressure. A) Contraction of transversus abdominis muscle pulls the posterior inguinal wall above and laterally creating tension in it (Dynamic shielding action), B) External oblique aponeurosis and posterior inguinal wall come closer (anterior-posterior compression action), C) Squeezing action and pulling effect of cremasteric muscle, D) Dense and strong cremasteric fascia exerts binding effect on structures in the inguinal canal for their optimal dynamic movements. The posterior inguinal wall is composed of condensed transversalis fascia along with the aponeurotic extensions from the transversus abdominis aponeurotic arch (Figure 3 inset). The condensed fibro-collagenous tissue and aponeurotic extensions give mechanical strength to the posterior inguinal wall to resist internal abdominal blows. The strength of the posterior inguinal wall is directly related to the number of aponeurotic fibers it contains and there is great variation in normal anatomy. In 47 % of individuals, the endo-abdominal fascia of the posterior wall gets full cover from the aponeurotic extensions. However, nearly 53 % of individuals have negligible or nil aponeurotic extensions. [10, 11] If aponeurotic extensions are absent, then the transversalis fascia alone cannot resist the internal blows for a long period and herniation occurs. Therefore, any new approach to inguinal hernia repair must consider replacing this element with any other suitable structure or material. Secondly, the posterior inguinal wall and accompanying aponeurotic extensions are physiologically active and dynamic. Muscular contraction of the transversus abdominis pulls this posterior wall and the aponeurotic extensions upward and laterally creating tension in it (Figure 4). Such wall with tension resists internal abdominal blows better than a wall without tension. This tension in the posterior wall is created in gradation as per the force of contraction of the muscles. And the force of contraction of the muscle changes as per the force of the internal abdominal blow. This is important physiological phenomenon. The posterior inguinal wall should be described as an independent entity, playing an important role in the prevention of hernia formation, not only because of its mechanical strength but also because of its dynamic nature. Such a physiologically dynamic posterior wall is constructed in the author's technique of repair. Contraction of a muscle increases the tone of the muscle to guard against the 'blows'. This is the "shielding action". Increased tone in the curved fibers of the internal oblique muscle by contraction gives protection to the internal inguinal ring. Increased tone in the aponeurotic extensions by contraction of transversus abdominis muscle gives dynamic protection to the posterior wall (Figure 4). The cremasteric muscle, an offshoot of the internal oblique muscle, is seen occupying the gap between the muscle arch and the incurved part of the inguinal ligament. Contraction and increased tone in this muscle gives direct protection in front of the posterior wall. Aponeurosis of the external oblique muscle gives generalized shielding protection in front of the inguinal canal without disturbing the exit of the spermatic cord at the level of the superficial inguinal ring. Contraction of the external oblique muscle (aponeurosis) and the curved part of the internal oblique muscle compresses the inguinal canal against the posterior inguinal wall (anterior-posterior compression, Figure 4). This is possible only if the posterior wall is also strong and physiologically dynamic. Superior-inferior compression of the inguinal canal takes place by movement of both the muscle arch and the incurved part of the inguinal ligament (superior-inferior compression). The inguinal canal gets compressed to a minimum space, thereby preventing hernia formation. The cremasteric muscle plays an important role by virtue of the arrangement of its muscle fibers. Contraction of crossing fibers around the spermatic cord squeezes the spermatic cord to reduce open or loose spaces in side the cord to minimum and brings all the contents near the internal ring together to plug it. This squeezing action prevents entry of any organ into the internal ring and the cord, thereby preventing hernia formation. The spaces between the muscle arch, cremasteric muscle, incurved part of the inguinal ligament and the posterior inguinal wall is filled with interparietal fibrocollagenous tissue (cremasteric fascia). The importance of the strength of this fascia in preventing herniation is not properly emphasized in literature. This fascia binds all those structures together for their optimal performance and to give protection in front of the posterior inguinal wall. If this tissue is strong then the lowermost bundles of the internal oblique muscle contracts better because of some anchorage it receives through those structures. This is elegantly seen in the author's technique of inguinal hernia operation. It was observed in all operated cases that the internal oblique muscle, which did not show any contraction on asking the patient to cough on the operation table, showed improved contraction after it was sutured to the upper border of the strip of the external oblique aponeurosis. This was obviously due to the new anchorage that this muscle received in this procedure. The cremasteric muscle is an offshoot of the internal oblique muscle and this fascia keeps them strongly together as one muscle for optimal performance and protection. It is probable, as stated by Read  that some metabolic changes in the collagen metabolism in this area result in loss of strength of this connective tissue that loosens those structures or muscles from each other resulting in proportionate loss of their performance and protection. Ideally, movements of the muscles and aponeurosis or tension in the strip should have been measured objectively with some device as described by Peiper et al, Chirurg 1998;69(19),1077E81. Since a measuring device was not available, this author could not measure tissue movements accurately. However, naked eye observations of such movements were felt to be adequate enough to draw conclusions. Anterior-posterior compression of the inguinal canal is lost due to the loose and adynamic posterior inguinal wall. Providing a strong and physiologically dynamic posterior inguinal wall is essential to restore this anterior-posterior compression. Local contraction of the muscle arch is essential to prevent herniation. Muscle arch contractions showed improvement after it receives new anchorage. Contraction of the cremasteric muscle provides an additional guarding effect in front of the posterior inguinal wall and squeezes and pulls up the spermatic cord to plug the internal ring. The strong cremasteric fascia between the muscle arch and the incurved part of the inguinal ligament keeps muscles dynamic by giving anchorage. New anchorage is provided by suturing a strip of the EOA between the inguinal ligament and the muscle arch in the author's technique. The author's technique is physiologically sound because: A) Absent aponeurotic extensions in the posterior wall are replaced with an aponeurotic structure. B) Additional muscle strength of the external oblique muscle helps the weakened muscle arch to keep the newly formed posterior wall physiologically dynamic. C) Contractions of the muscle arch are improved. Similar study conducted with a device that measures tissue movements and tensions accurately, can provide conclusive evidence to support the statements made in this article. No shutter mechanism is restored at the internal ring or the inguinal canal level or no efforts are made to bring down the highly placed muscle arch, if present. But still, the results of the operation are excellent with virtually zero recurrence rate observed by the author in his series wherein 106 patients were followed up for more than 10 years . Providing a strong and physiologically dynamic posterior wall should be the principle to be observed in any type of inguinal hernia repair.